Crystal Cruise Line, famous for it's unparalleled luxury ocean cruising experience, recently entered the river cruise market. (Four new build ships sail in 2018) The Crystal Mozart, built in 1987, was purchased by Crystal and stripped down to the steel bars and completely redesigned and reimagined. 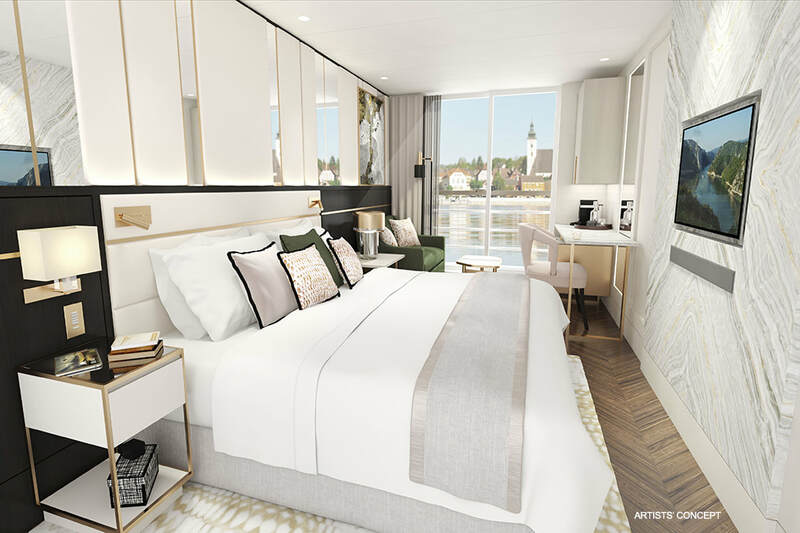 The Mozart is double the width of other European cruise vessels, allowing Crystal to offer a spacious all inclusive luxury experience on the river. Here are few features that set Crystal apart..
and an evening at Belvedere Palace for a guided tour and a private performance of Strauss and Mozart in the Marble Hall. Limited-Time Savings of $1,000 Per Suite*Reward yourself with Early Booking Savings on 2018 Crystal River Cruises The All Exclusive™, all-inclusive value of the Crystal River Cruises™ Experience is even greater, with Early Booking Savings on most 2018 Crystal river voyages. Book by December 31, 2017 and enjoy up to $1,000 savings per suite on the unparalleled luxuries found aboard the all-suite, butler-serviced Crystal Mozart and the all-balcony, all-suite quadruplet sister ships Crystal Bach, Crystal Mahler, Crystal Debussy and Crystal Ravel. Sailing stunning routes along the Danube, Rhine, Main and Moselle Rivers, these stylish river ships embody a new standard of elegance on Europe’s grandest rivers. Book your journey today and discover the exquisitely appointed world of Crystal River Cruises. *Book by 12/31/2017 to avail of the Early Booking Savings Offer. Offer applies to new bookings only as of 10/01/2017. Crystal River Cruises’ Early Booking Savings promotion applies to all 2018 River voyages with the exception of voyage RMH180403-07, RMH180512-16, RDB180503-07, RDB180510-10, RDB180606-07, RDB180623-07, RBD180727-07, RDB180916-07, RRV180621-07, RRV180913-07. To avail of additional 2.5% Early Full Payment savings, Cruise must be paid in full 180 days prior to departure to qualify. Cruise-only fares include all promotional savings. Note: Early Full Payment savings do not apply to Personal Select Air. Solo Traveler Fares are available upon request. Crystal Cruises - Crystal Mozart Launch from Signature Travel Network on Vimeo.